The Ting Tings topped the British charts with That's Not My Name in 2008. It also did well on the dance charts. It's all been downhill from there. The Ting Tings are from Manchester, England. Lead singer Katie White led the group TKO while in school. She met drummer Jules De Martino and they formed Dear Eskiimo and they signed with Mercury Records. That went nowhere due to a management change. But they continued to work together and called themselves The Ting Tings after a friend of Katie's. They started playing gigs and record companies came calling. They released a couple of singles on the local label Switchflicker. The second single Fruit Machine got airplay on BBC. And this led to a deal with Columbia in late 2007. 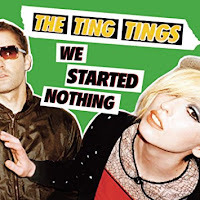 Their debut album We Started Nothing was released in 2008. That's Not My Name topped the British charts and reached #4 on the US Dance chart. They had a couple more hits in England. That's Not My Name is about Katie's distrust of the record business. They recorded an album in Germany but decided to scrap it against Columbia's wishes. De Martino said it was too Euro Pop influenced and sounded like everything else on the radio. Sounds From Nowheresville was released in 2012. When it didn't do as well as the first album and there were no hit singles, Columbia dropped them. I'm sure they were still upset about the scrapped album. They now record for Finca Records. They seem to be the only artist on the label but I couldn't tell if it was self owned. The album Super Critical was produced by Duran Duran's Andy Taylor and was released in 2014. It says on their website they are recording a new album. 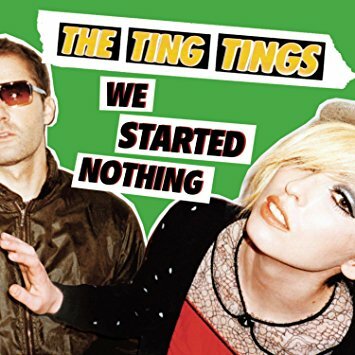 So The Ting Tings had some success at home but it looks like that is in the past. Here's the video for That's Not My Name by The Ting Tings. This was the first of three videos produced for this song. Guilty pleasure of mine. Love to listen to this song and turn up the volume every now and then.